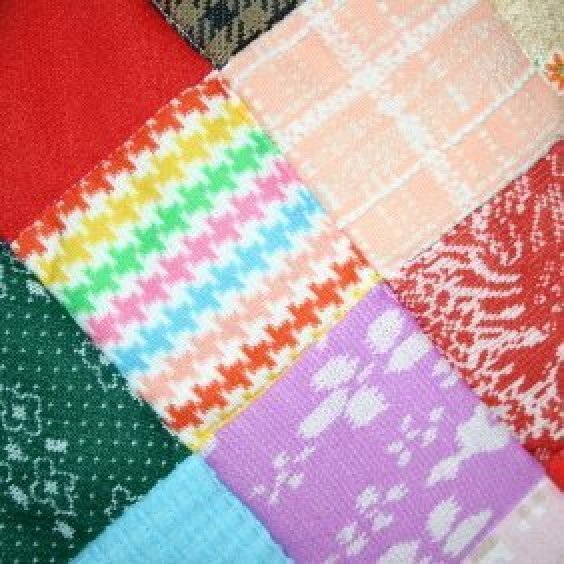 Memory quilts can be made from a variety of clothing fabrics, providing a beautiful memory that can also keep you warm. 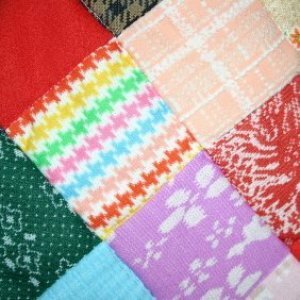 This is a guide about making a memory quilt. This is a tip for people into quilting, or just into family heirlooms. When my son was about two years old he wanted to build a tent. I got out an old white sheet and hung it between two chairs. We used this same sheet to be his tent for many years, and eventually we began to color, draw pictures, make designs, or write sayings or just whatever, with permanent fabric markers on the sheet. Everyone had to sign their drawings and date them. All the grandparents, friends, and relatives drew on the sheet over the years. In fact, it kind of became a tradition. Before the sheet got too old, we took it and had it made into a quilt top. My son is seventeen now, and this quilt is one of his prized possessions. Now that all of his grandparents and great grandparents have passed, he can look back at the pictures he drew with his "best friends" and he can still even recall some of the stories that went along with some of the drawings. The quilt is priceless to me as well. I love reading some of my parents' and grandparents' quotes and wishes to my son for his life, seeing their drawings and signatures and recalling those wonderful times we all had together. My husband and I lived on a farm and through the years he wore and wore out many flannel shirts. I saved them all and finally made a crazy quilt from the best parts of them, including some pockets and buttons. I made a memory quilt of my son. I cut out pieces of some of his tee shirts, and also transferred pictures of him at different ages and put them on cloth, then put it altogether as a lap quilt. Also you can make for your children with their children on it for a gift, using, of course, some of their kids clothing and pictures. What a great gift to give. Give each member of your Thanksgiving family/friend dinner a square of cloth and ask them to write the year and what they are thankful for. Do this each year until you have enough to make a quilt. It's interesting to see how young people have progressed in their priorities and to be able to read what people were going through at the time. Source: The Month Ahead (local) magazine. Would it be possible to make a memory quilt from a purchased duvet cover or comforter? Could you iron photos/printed transfers directly onto one? I thought this would be easy for someone who doesn't sew/quilt. You could use fabric paints to decorate around the photos? This seems like a pretty big project to tackle and would be difficult to "undo" if mistakes were made. I feel sure what you have suggested can be done but why not try something smaller so you can have a "trial & error" piece to work on? Maybe you could find something smaller - baby quilt, pillow sham, or just a thick piece of fabric to try your art on. The practice fabric piece would not even have to be solid for you to get an idea of what you want to do. Most of your supplies can be purchased at a local fabric or craft store (Jo Ann's, Michael's) and they may have a lot of good suggestions on how to proceed. How can I incorporate little girl's dance recital costumes into a memory quilt? If the front upper part of the costume is pretty (and they usually are), use it. Follow any designs or trims on the front of the costume all you want (tack trims, beading, sequins, lace, or embroidery, down before cutting into it!). Cut the costume to display the prettiest parts w/out regard to shape. Then mount the costume piece onto a square/rectangle of fabric that is flattering to the costume and that you want on the quilt. 2) By sewing the front of the costume to a square, the costume part can be any shape and still work because it is sewn onto the square shape you need (I assume). You want the memory of the lines, the shape, the best parts of the costume to stand out, which you can't do when you have to make squares of little clothes. 3) It is so cute if you can leave the necklines with any trims intact. Mounting a satin ballet costume front to a square of velvet or velour so that the neckline of the costume is accentuated would be so pretty! Be creative. My son danced as a little guy and I used his sequined vest fronts stitched intact onto squares, with the vests still open. Inside the vests the fabric squares have appliqued pictures of him dancing in those costumes! I think you should be whimsical with the costumes. I took a shirt front from 1 of my son's costumes, strengthened it by mounting it on a square of fabric and then sewed his bow tie in place on the shirt. I used the fancy cuffs the boys' costumes often have. When he wore hats that had a band around it, I took a photo and appliqued it to a square and used the hatband like a stripe. I'm whimsical with all my memory quilting. Little shirts my son wore that had pockets, I did things like sew a little fabric toy he loved peeking out of the pocket, or do that photo thing where you mount photo on fabric (I just call it applique) of him doing something while wearing that shirt and make it look like there's a photo sticking out of the pocket. I do all sorts of crazy things. For instance, instead of using a large piece of clothing for a memory square I use parts of it and "scatter" these things on the quilt. Like the little sewn-on patch from his first sleeper, little ducky buttons from a tiny sweater, I dressed him in overalls a lot and I used a few straps as "stripes" on squares, all hardware intact. There is some of the small embroidery on some of his things, like the turtles from TMNT shirts he didn't want to give up, or Lilo & Stitch, another favorite of his. Those sort of decorations are scattered around, a patch spanning corners of quilt squares coming together, the little ducky buttons in a row next to his first bathing suit, a picture of Superman embroidered on his PJ top cut out and nicely mounted on a square of the blanket he insisted was his Superman cape! I would say to have fun. Use some of the tulle skirt if the ballet costume has it. Sew it to the edge of the quilt, depending on how many costumes you have and the size of the quilt, you could go all around the outer edge of the quilt. See if there is a way to use what she might have had in her hair for the performance. You want to see the "character" of the memory when you look at the quilt, an immediate recognition, not a square you have to think, "Hmmm... Oh, yeah! It came from that costume that had the cutest ______, but I didn't use it." One more tip, make sure you check the trims on any costume. They weren't meant to last a long time. I make costumes, bridal items, etc. If you want the trim to hold, make sure you knot it off every 5-7 beads, pearls, or sequins. If your thread breaks in a spot, you don't have a disaster on your hands. Oh, and if I feel I need something strong (like for a quilt that might be used). I use very strong thread or dental floss tape to sew on the beads, pearls, etc. I have been asked to make a quilt for a niece out of her deceased aunt's clothes. The clothing she sent is a mixture of knits, flannels, wovens, and lacy fabrics. How do I meld all these different fabrics together? Some are heavier than others. What kind of stabilizer would be appropriate without making this too heavy? This is also her wedding quilt so it needs to be special. And finally, what kind of quilting would work? I am a handquilter and with some of these fabrics I'm stumped.